Fine motor and math is such a fun combination. It turns math into a fun and hands-on activity. What could be better? 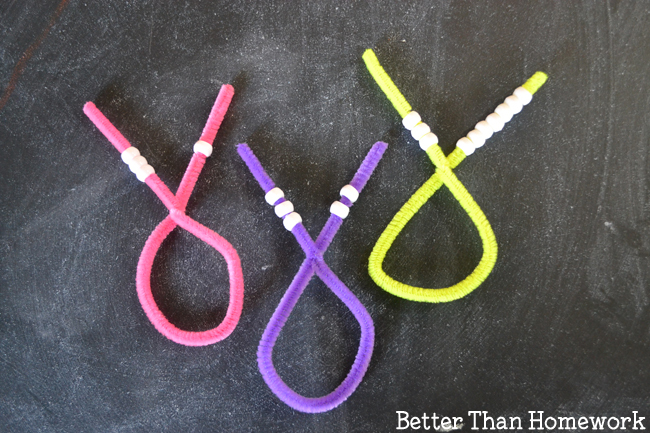 This Fine Motor Addition Bead Threading activity does just that. It turn addition in a hands-on activity that’s engaging and fun. Let’s grab some supplies and get started. Disclosure: CraftProjectIdeas.com provided the supplies used in this post. This activity and all ideas are my own. There are Amazon Affiliate and other affiliate links in this article which means, at no additional cost to you, we could receive compensation for our recommendations. You can read our full disclosure policy on our Disclosure Page for more details. I love this activity because it requires just a little prep time. The supplies are common and easy to find and prepping this activity takes just a few short minutes. 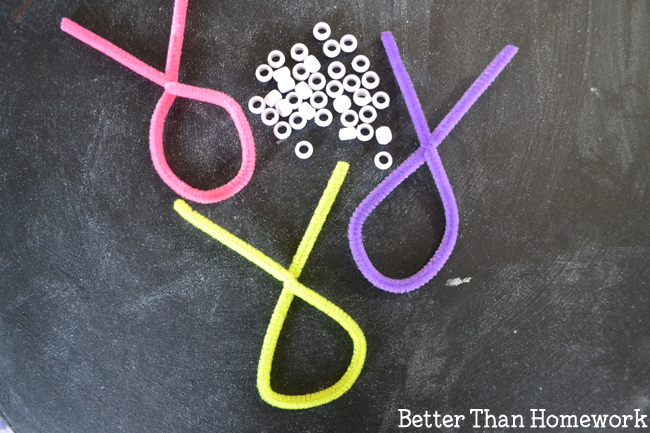 To prep this activity, take two or three of your pipe cleaners and twist them into a loop making sure you have two tails with enough room to string several beads. (See photo above for an example). 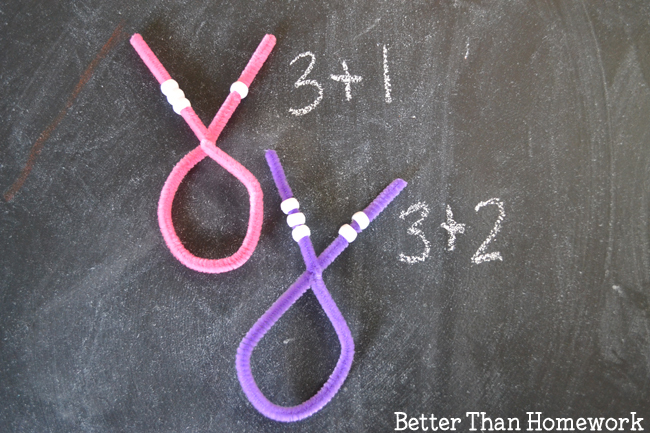 This activity is so simple, but it’s a fun way to practice addition. To start, you’ll need one of your pipe cleaner loops. Choose an addition problem and grab your beads. Take the sum, 3 + 7. To solve this problem, add three beads to one of the pipe cleaner tails and then add seven beads to the second tail. Count up your beads to get your total, ten. 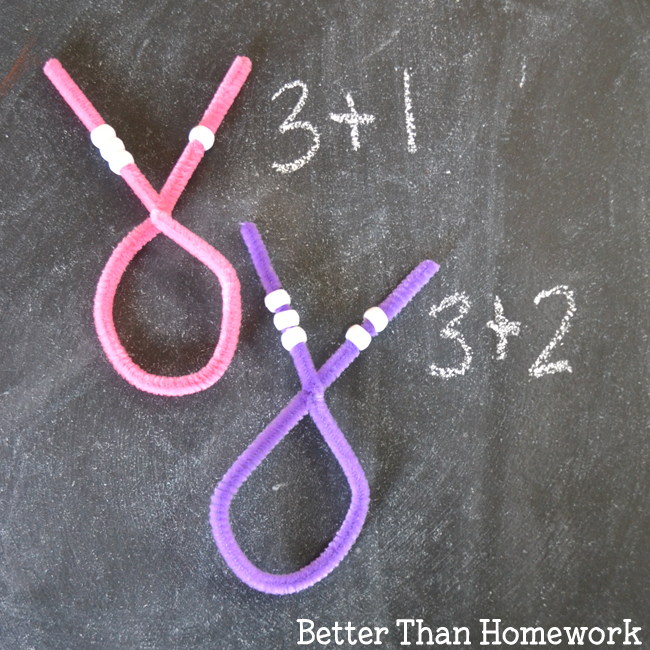 Add beads yourself to your pipe cleaner loops and have your child write down the addition problem. For example, in the photo above, they’d write, 3+1=4, 3+2=5, and 3+7=10. 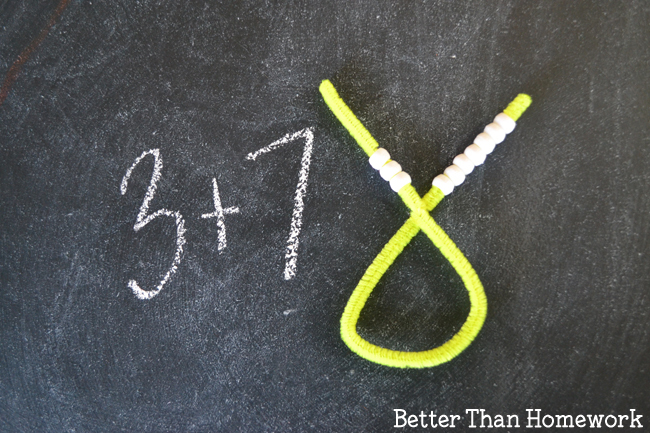 If you’re working with a preschooler, keep the pipe cleaners in a long stick and have your child work on numbers. Give them the number 9 and have them string nine beads on their pipe cleaner. Create a busy bag from this activity. Add some flashcards, beads and pipe cleaner loops to a small bag. Now you can take this activity along on the go or have it ready for your child any time they want to work on addition. 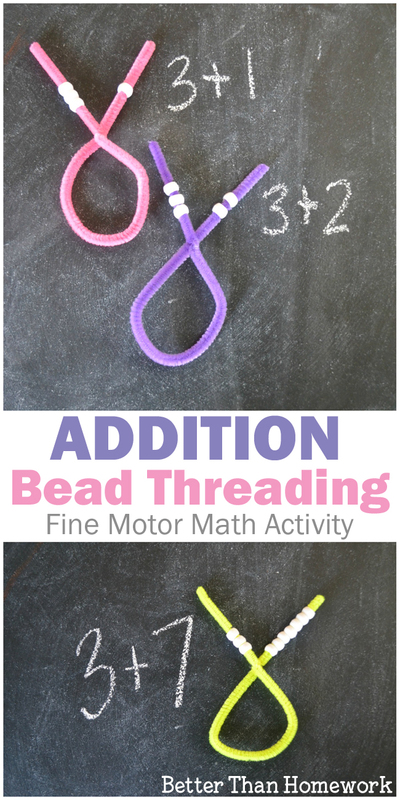 If you enjoyed this Fine Motor Addition Bead Threading Activity, the above photo is perfect for sharing on Facebook or you can save the photo below on Pinterest.